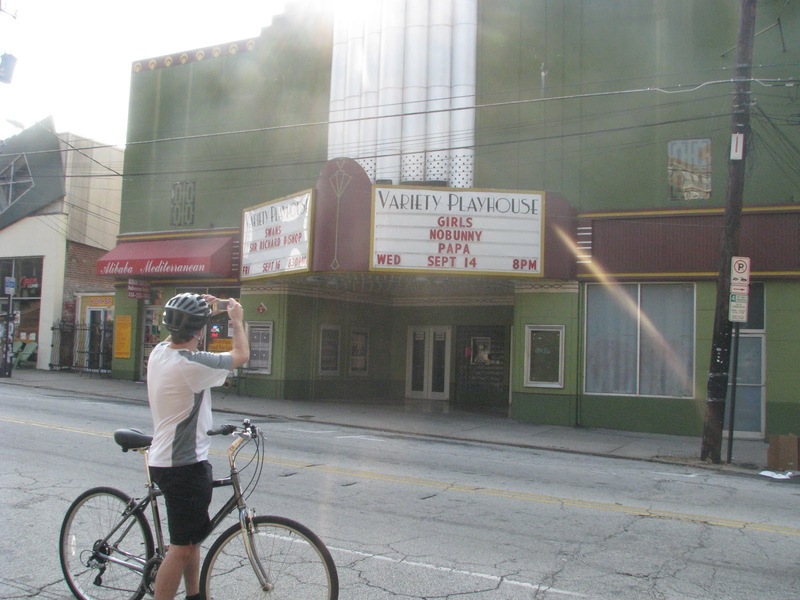 Finishing up my series on the great bike ride I recently enjoyed from Bicycle Tours of Atlanta (here are parts 1 and 2), this installment looks at some great entertainment options that happened to be in town while we rode. First up, courtesy of my guide Robyn, is me taking a photo of a theater called the Variety Playhouse in the hipster neighborhood of Little Five Points, where my favorite new band, Girls, was playing. Unfortunately, my flight was leaving for home in a few hours. I would go on to miss Girls play in D.C. a few nights later for some similarly lame excuse. Next, we wound our way downtown, where we had lunch and wheeled past the famed "fabulous" Fox Theater, where one of my son's favorite kids groups was set to perform. If you aren't yet familiar with Yo Gabba Gabba!, watch this bit with Jack Black. And finishing out my blog bike tour, we stopped by the Martin Luther King National Historic Site, which is a large complex not far from the spot where the bike tour leaves from, in the Old Fourth Ward. Two highlights were seeing the wooden wagon MLK's coffin was carried in as part of his funeral march, and the gentleman in the photo who serenaded Robyn and I with a song of faith. Too bad the others didn't get to enjoy this experience. Yuck Rocks. Black Cat Sound Guys Don't Rock.